Early in the morning of 10th February 1567 an explosion rocked Edinburgh. The Lord Provost’s house, at Kirk o’Fields, had been blown up with gunpowder. In the garden, unmarked by the explosion, were two bodies. One was that of a young man who was just past his twenty-first birthday - Henry Stuart, Lord Darnley, and King of Scots by marriage to the Scottish sovereign, Mary. The city was in uproar – who was behind the assassination? Suspicion soon fell on James Hepburn, Earl of Bothwell, and shortly after, on the queen herself. Queen Mary and her husband had been on bad terms – he had been involved in the assassination of her secretary, he had been willing to risk the queen’s own life by carrying out the murder in front of her eyes when she was in the late stages of pregnancy, he had undermined her authority and he been anything but a supportive consort. 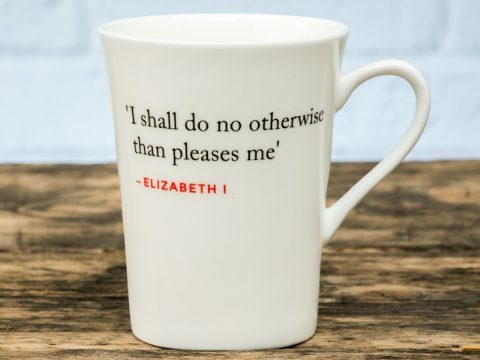 Queen Mary failed to act with the vigour she should have shown in hunting down the assassins of her husband – translated overnight from a burden that the majority of the Scots nobles as well as their queen loathed, to a martyr. The only people who appeared to care about finding Darnley’s murderers were his parents – Matthew Stuart, 4th Earl of Lennox, and his wife, Lady Margaret Douglas, cousin to the English queen, Elizabeth I. The Lennoxes - he in Scotland, and she in England – implored that justice be done, and the killers found, but Queen Mary dragged her feet. Eventually, she gave permission for Lennox to bring a private prosecution against the Earl of Bothwell. On the day appointed for the case to be heard in Parliament, Lennox approached Edinburgh with a large retinue, to match that which Bothwell had. Orders were sent to Lennox, ordering him to leave his men outside the city, and approach with only six. Lennox sent back a message that he could not enter the city unprotected, as he feared for his own life. Thus prosecution could bring no evidence, Bothwell was acquitted. The Lennoxes were convinced that Bothwell and the Queen were the guilty parties. The earl supported the insurrection that broke out when Mary married Bothwell (whether she did so willingly or was coerced has been debated since the moment the ceremony took place) and was delighted when she was deposed in favour of her son, his grandson, who was crowned as James VI, despite being less than two years old. 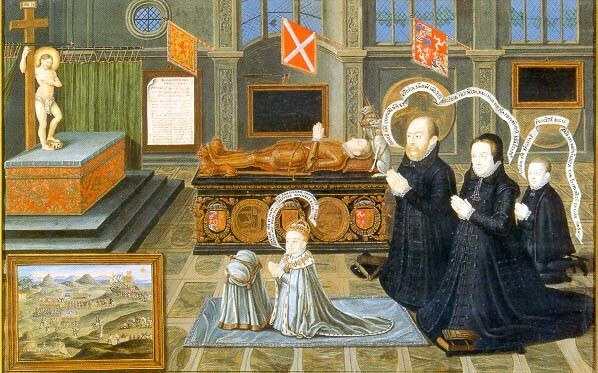 To preserve the memory of their son, and to encourage James VI to remember his father, and seek vengeance, in 1568, Lennox and his wife commissioned a painting, from the Antwerp artist, Livinius de Vogelaare (fl 1551 – 1600). The painting is reminiscent of many family portrait groups. To the left of the scene is an altar with Christ holding the cross, rather than depicted in a traditional crucifixion. 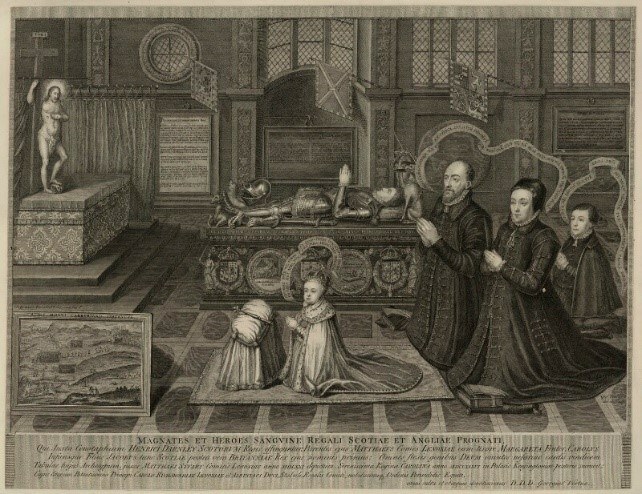 Kneeling in front of the altar is the young king James VI, crowned and wearing robes of state. Behind him are his grandparents, the earl and countess and their remaining son, Lord Charles Stuart. All three are dressed in black. At the back of the scene, is the body of Lord Darnley, dressed in armour, and lying on a tomb decorated with his heraldic achievements. Banners hang down, embroidered with the royal arms of Scotland (l), Darnley’s own arms (r) and a third banner of gules a saltire argent (unknown – perhaps a variation on the Lennox banner of argent a saltire gules). On the side of the tomb are two insets, one showing Darnley and his page being dragged from their beds, and the other, their bodies in the garden at Kirk o’Fields. But this is not an ordinary portrait – it is a call to vengeance. In the bottom left of the canvas, a painting is inset, depicting the overthrow of Mary at the battle of Carberry Hill on 15 June 1567 by the confederate Lords, later referred to as the King’s Party. Mary is depicted as surrendering, whilst Bothwell escapes. Her captors are bearing an inscription. The Lords bear a banner depicting Darnley, with the words ‘Judge and avenge my cause, O Lord’. To drive the message home, there are various inscriptions, calling for vengeance. Surrounding King James’ head are the words ‘Arise O Lord, and avenge the innocent blood of the king my father and, I beseech you, defend me with your right hand’. By the 18th century, there appear to have been two copies of the painting. One was given to Queen Caroline, in 1736, and kept at Kensington Palace. This is now in the Royal Collection, and is displayed at Holyroodhouse Palace, Edinburgh. The other copy was at Goodwood, the home of the Duke of Richmond and Lennox – the title of Lennox was revived for the illegitimate son of Charles II. This latter painting was the subject of an engraving by George Vertue (below). There are numerous copies of the engraving – one is the National Gallery of Scotland and another is at Temple Newsam, the childhood home of Darnley.